Always drill into a sacrificial board - not cast iron! The pillar drill is not the first machine that comes to mind when equipping a woodworking workshop as these are traditionally machines employed by metalworkers. 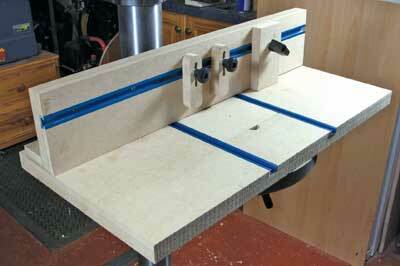 In reality it is difficult to overstate their usefulness to the woodworker. Whilst I got by for many years doing all my drilling work with a drill in a stand, it was only when I bought a pillar drill that I realised their versatility. Mine is now the most frequently used piece of machinery in my workshop, whether it is being used for drilling, light mortising or as a bobbin sander. The business end of a pillar drill is the chuck, mounted by means of a Morse taper into a quill driven through a series of pulleys by an induction motor. The quill is raised and lowered by the use of a handwheel and the whole assembly is mounted in a fixed drill head casting. This is fixed to a column to which is also fitted a rack and pinion system on which the work table is raised and lowered. The table, which is slotted to accept vices, etc. can also be rotated to position the work appropriately and tilted for angled work. 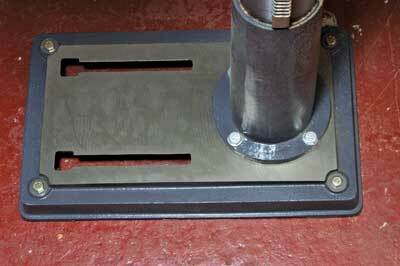 To work on large pieces, the table can be rotated to one side and the work mounted on the base of the machine. 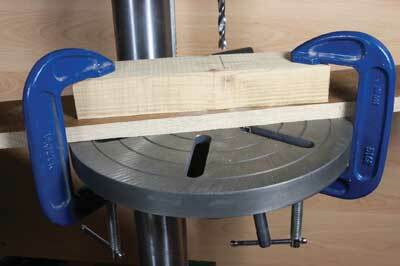 The machine may be either bench or floor mounted, the only difference being in the length of the column. 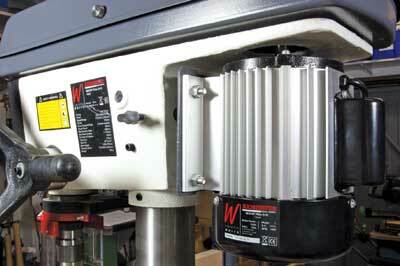 The motor is an important determining factor in the usefulness of the machine. Cheap machines with low-powered motors, whilst fine for DIY use, will soon prove a disappointment. Spending a little more on a machine with a motor of at least 3/4 horsepower - 550W - to 1 horsepower - 750W - will be a sound investment. 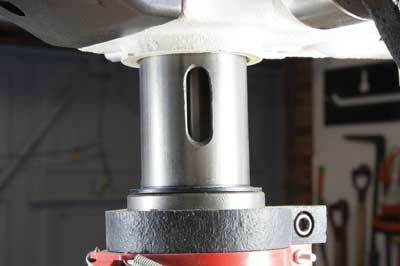 Most pillar drills are driven by a system of belts and pulleys that may be adjusted to provide a range of speeds. Matching the speed of the drill to the work is important, not only to achieve a clean cut in the work but also to avoid overloading the motor and to maximise the working life of your drill bits. 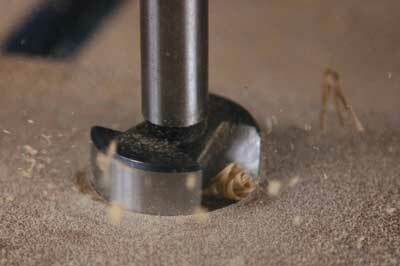 The quill is the working end of the machine to which the chuck is fitted. It is raised or lowered by means of a wheel or handle. 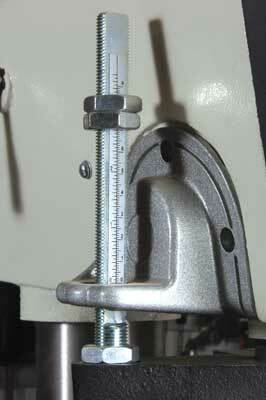 The quality of the bearings used to support the quill determines the accuracy of the machine. When buying a machine, it is important to check for any play in the bearings and steer clear if there is perceptible sideways movement. The table is slotted to attach a vice for holding smaller workpieces, but this also allows the fitting of sub-tables and jigs. 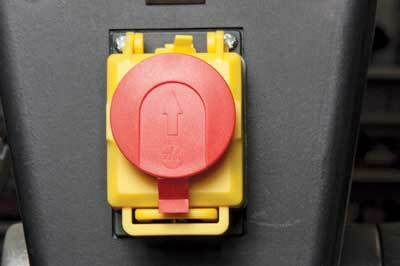 An NVR switch is fitted to prevent accidental starting. 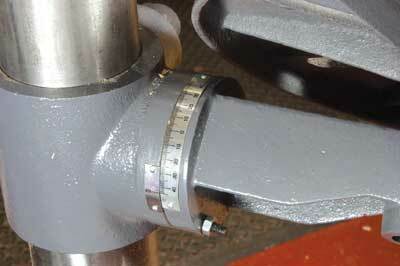 The chuck is protected by means of a guard clamped to the quill bearing flange. 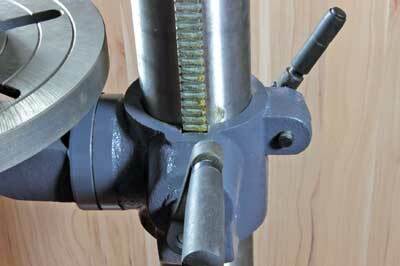 The guard may be raised to enable fitting of drill bits but should always be lowered into place when drilling. The rise and fall system supporting the table consists of a rack and pinion fitted so that the whole mechanism can be rotated around the column. In the machine illustrated, the rack is held in place by collars at the top and bottom of the column, the table height adjusted by means of a crank handle and the whole mechanism locked in position by means of a clamping lever attached to the table mounting bracket. Most machines are designed for metalwork, where the work is usually held in a vice whereas woodworkers will often need to clamp work directly to the table. Inconveniently sited ribs under the table can render clamping difficult, so ensure that the machine you choose has a good clamping surface underneath. A table that can be tilted for angled work is preferable to one where the table is fixed. 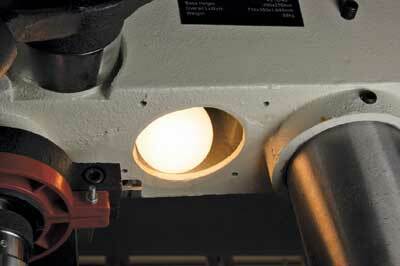 A work light built into the body of the machine will prove advantageous to safe and accurate working. The chuck fitted to most machines will be of the keyless type and will be matched in its capacity to the power of the machine. A useful capacity to aim for is 16mm, which will be sufficient for most purposes. If changing the chuck, do not be tempted to replace it with one of larger capacity than the original as you risk placing stresses on the motor and drive mechanism beyond those for which they were designed. 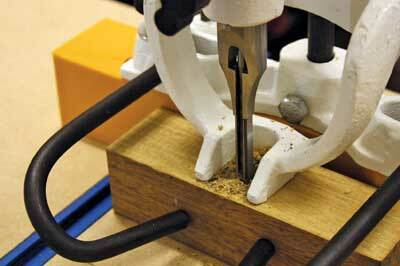 An adjustable stop ensures the hole is drilled to the correct depth. 1. All of the usual safety precautions for the use of woodworking machinery should be taken when using pillar drills, but particular attention should be given to eye protection to avoid the risk from flying debris. Clamping the work is also crucial. It is tempting to hold a workpiece on the table by hand, but serious injury can result if your hands are drawn into the drill bit, so a few seconds spent clamping or securing the work can save spending hours in A&E. Loose clothing and jewellery should also be avoided and long hair tied back. Pillar drills are heavy and the weight is concentrated in the drill head making them unstable unless bolted to the bench or floor. 2. Many types and sizes of drill bit can be used, so to maximise the effectiveness of the machine and the quality of the work, match the speed of rotation to the size of the drill bit. Speed charts are available giving detailed recommendations for different bit types and materials, but as a guide, bits under 10mm may be run at up to 3,000rpm in softwood or 1,500rpm in hardwood, whilst larger bits up to 25mm may be run at up to 750rpm in softwood or 500rpm in hardwood. 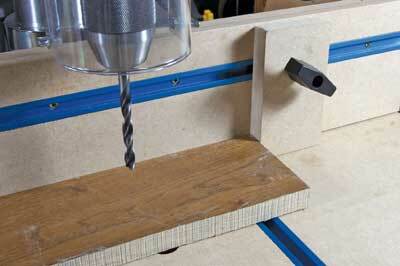 Brad point bits should be run at slightly slower speeds than twist drills. Forstner bits in softwood and hardwood will vary from 1,500/750rpm for a 6mm bit to 500/250rpm for a 50mm bit. 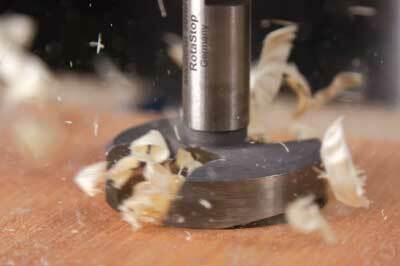 Larger bits and hole saws should run at speeds of 250rpm or lower. 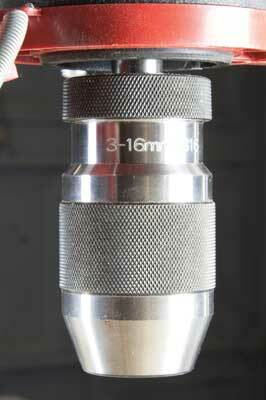 Heed the manufacturer's recommendations for maximum bit size to avoid damaging your machine. 3. 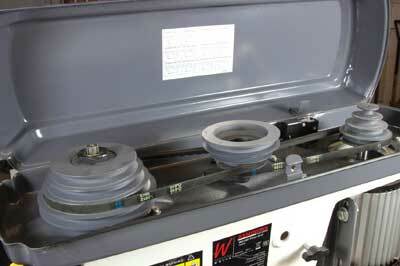 Speed is changed by altering the position of the belts on the pulleys. 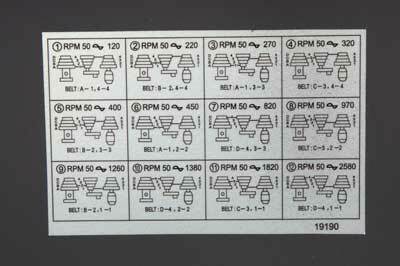 A chart may be printed on a sticker inside the pulley compartment. 4. Work should be clamped to the table and if the hole is to go all the way through the workpiece a sacrificial piece should be placed underneath to limit breakout and prevent damage to the table. 5. 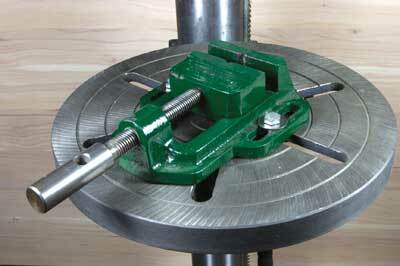 A vice may be used to hold small work; it should be securely bolted to the table for accuracy and safety. 6. 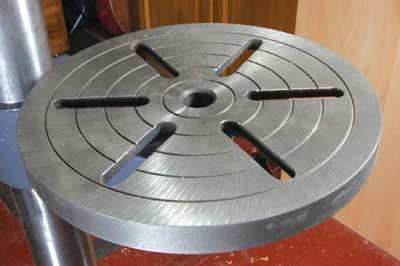 A sub table to which fences and hold downs can be attached is much more versatile than an engineer's vice. Tables are available commercially but are easily made from MDF or plywood and may incorporate t-track for attaching fences and jigs. 7. A fence is useful to ensure consistency when drilling multiple pieces or a series of holes. 8. Stops attached to the fence further facilitate accurate repeat work. 9. 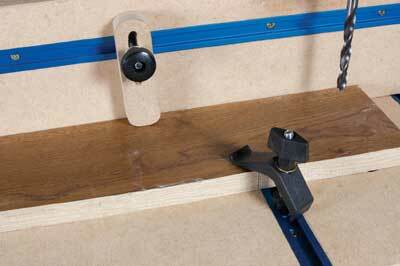 Hold downs are a useful alternative to clamps for securing work. 10. 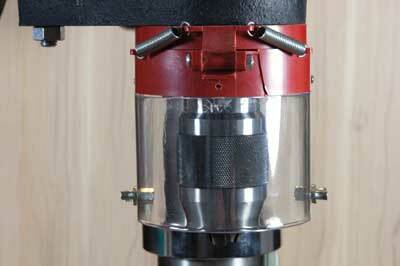 Pillar drills can be used for light mortising work with a suitable attachment. 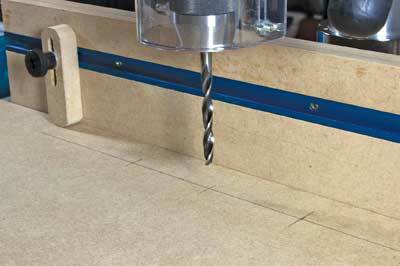 My article on converting your pillar drill in WPP 71, page 55, gives more details and also shows how to make a sub table for the attachment and other jigs. 11. 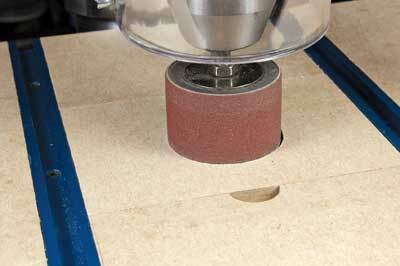 A pillar drill fitted with a sanding drum makes an effective substitute for a bobbin sander.